A view of the balconies of the Queen Mary 2 as seen from the bridge. QUEEN MARY 2, NORTH ATLANTIC » While enjoying a luxury experience on board this ship, I've been remembering that Cunard Lines and I go way back -- more than 50 years, as a matter of fact, and certainly farther back than any member of this ship's crew. Cunard played a crucial role in my life when it helped a naive young American begin embracing a wider view of the world. At age 25, in the fall of 1957 and almost on a whim, I decided to make my first trip abroad. I sailed from New York City to England aboard a smoky, coal-burning 35-year-old Cunard ship named the RMS Scythia. Comfort was minimal, and though it took nine days to sail to Liverpool, I loved every minute of it. Truly, I wished it had taken longer. 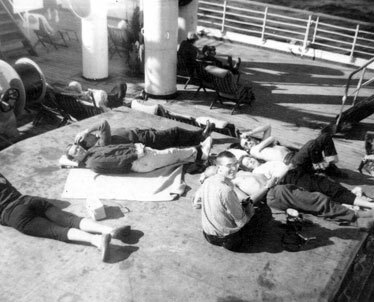 The Blunt End Kids relax on deck in 1957 on the Scythia. Bob Bone is the kid with his head turned back toward the camera. Cunard Lines has come a long way since my journey from New York to Liverpool in the fall of 1957. Stabilizers were unknown in those days, and the ocean was often rough. I shared a dimly lighted four-berth inside cabin with three other guys. Since there was no porthole, we never knew what the weather was like until we made our way up to an open deck. Our bathroom was in an obscure corner down a passageway, and taking a shower was something like performing a ballet in a tin can. Robert W. Bone, a frequent contributor to the Star-Bulletin's Sunday travel section, has been awarded the Silver (second place) Award in the Bay Area Travel Writers Planet Earth 2008 writing competition, for his story "Vietnam: Beautiful Contrasts Amid Controlled Chaos," which appeared here on Nov. 19, 2006. Gold Award: Editor Camille Cusamano for "Greece: A Love Story: Women Write about the Greek Experience"
The Scythia offered three categories of travel: First Class, whose members were said to live in some mysterious garden in the forward part of the ship (we called it the "Sharp End"); Cabin Class, which occupied the Limbo-like middle portion; and then our own Tourist Class. Our quarters, dining room, lounge and a small section of open deck, were at the stern. But a congenial, multicultural group formed among these passengers, and we soon began calling ourselves the "Blunt End Kids." Most of us were young British and other Europeans returning home after a summer in the U.S., and Americans en route to fall classes in England. Unlike either of these categories, I had no idea what I was going to do at voyage's end. I had bought a one-way ticket. The food was strictly British. I quickly learned not to routinely shake salt on my already salty spinach, especially from a single-hole cellar, a type this neophyte traveler had never seen. At night we had an orchestra of sorts. It consisted of four gray-haired men on violin, piano, drums and saxophone. They regaled us with tunes that included "A White Sport Coat and a Pink Carnation" and "You Came a Long Way from Saint Louie." I learned to dance the schottische. I also learned that it was easy and fun to run upstairs between decks in rhythm with the downward pitch of the ship on the heavy Atlantic swells. The Blunt End Kids did not rate an elevator. Our lungs were full of bracing sea air, and our legs were strong. In my exuberance one midnight, I climbed to the top of the mast to look down on what seemed to be a tiny toy boat bobbing about in the midst of a great, dark sea. Over the subsequent 50 years, I have continued to travel from time to time by ship, always with a greater degree of comfort and luxury than was provided by the Cunard Scythia. I began to enjoy staterooms that included a porthole, then later a genuine window. I discovered private bathrooms, double beds, air conditioning and bright lighting. Telephones began to appear, then radios and finally TVs and even WiFi for my computer. Classes of travel disappeared, and I discovered that I could always find at least one classy bar up near the bow without sneaking past a "First Class Only" barricade. The food began to improve and so did the entertainment. There were now big bands, singers, dancers, comics, magicians, jugglers, ventriloquists, etc. Ships began to sport elevators, discos, movie theaters, shops, libraries and more. Writer Robert W. "Bob" Bone in formal duds on the QM2. 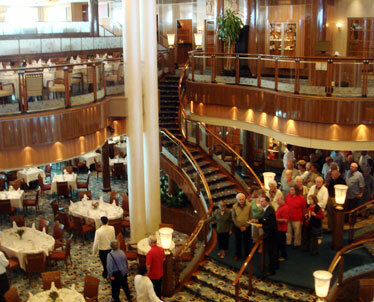 Passengers entering the Queen's Grill, a two-story dining room on the Queen Mary 2. IN OCTOBER 1986 I was again seduced by Cunard, embarking on what turned out to be a harrowing trip for some on the Queen Elizabeth 2. She made her way from New York to Southampton through gale-force winds and heavy seas. 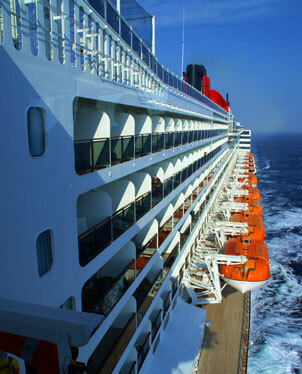 The Transatlantic Season for Queen Mary 2 will run from April 16 through Oct. 22 this year. All crossings between New York and Southampton are six days, and staterooms begin at $1,195 per person. Queen Elizabeth 2 will have four more crossings between the two cities before she is decommissioned. Fares begin at $1,199 per person. Details on these and other Cunard voyages are available through travel agents or through Cunard's Web site at www.cunard.com. It was the QE 2's last voyage before being "re-engined," refitted from steam to diesel power. Before it ended, one of her two sets of stabilizers became inoperative, and so when she rolled, she rolled more one way than the other, a most unsettling feeling. The author James Michener was at our table one evening, quite frail and walking with a cane. All the rest of us felt at least as unsteady as he. It was difficult for anyone to make headway on the rolling deck. Dishes broke, wine and caviar spilled, and in the staterooms, some passengers put their mattresses on the floor to keep from rolling out of bed. This was not always helpful; one friend was struck in the head by her telephone during the night. My wife and I recall going up to the dance floor, where we found that we tended to fall into the bar on one roll and into the band on the other. Strangely enough, we enjoyed that trip, too, and unlike many others, we made it to every meal. NOW I AM aboard Cunard again, this time returning westward across the Atlantic from England to the U.S. on the Queen Mary 2. Launched only in 2004, the QM2 was until recently the largest passenger vessel in the world. Perhaps she is still the largest with a sense of dignity, because the ship eschews rock walls, ice skating, surf machines and the like. In any case, she is several times larger than the Scythia. Circumnavigating her Promenade Deck means walking more than a mile. A porthole? A window? No sir. We have two deck chairs on a commodious verandah attached to our stateroom. If we want to check the weather or breathe genuine sea air, we simply open the glass door on our balcony. If we want to sit out there for a while, we first take out a drink from our stateroom fridge, and phone to ask our steward to deliver a tray of canaps. Bunk beds? Separated singles? Absolutely not. We have a king-size mattress. A radio? Nope. It's a color TV, with some channels carrying programs originating on the ship, some with commercial movies, others with satellite reception of CNN, Britain's BBC and Sky News, and even, improbably, Al Jazeera in English. Our private bathroom has room enough for two to take care of several tasks at the same time. There's also mood lighting, an ample couch and a walk-in closet that seems about the size of my entire living space on the HMS Scythia. Several restaurants offer varying cuisine. One favorite for lunch is the Golden Lion, a British-style pub where fish and chips is a mainstay but which also serves other pub-style dishes. And there is room service, offering almost anything edible at any hour of the day or night, for no extra charge. Of course, there are many more areas available for exploration: bars, lounges in different decorative themes, theaters (yes, plural, there are three, including a planetarium, the only one afloat, we're told), a showroom, a computer/Internet room, a library -- that, too, reputedly the largest afloat -- a weight room, a spa, a game room and probably some others I have not yet discovered. All these things are open to all, the only impediment being the need to occasionally hike from one end of this ship to the other, a job that might be accomplished better aboard a London bus. 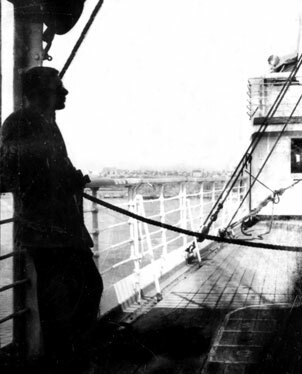 Bob Bone is seen in silhouette near the end of his voyage on the Scythia. RMS Scythia, left, was in service from 1921 to 1958. The Queen Mary 2, right, was docked in Honolulu earlier this year. THE NUMBER OF shops and public rooms on the QM2 sometimes gives the impression that I am exploring a world-class urban shopping mall. But despite all the lounges, etc., it is sometimes difficult to find a quiet corner. Our passenger list numbers more than 2,500, just about full capacity. In the QM2 library, I found a couple of pictures and some information about my beloved Scythia. She turns out to have sailed her maiden voyage in 1921, and was broken up for scrap in '58, less than a year after my own voyage. In the 1950s, the Scythia was one of Cunard's dozen ships. Today the fleet consists of only three: the QM2, the Queen Elizabeth 2 (launched in 1967) and brand-new Queen Victoria. The QE2 will soon take on a new role as a permanently moored hotel in Dubai after serving for 40 years. Cunard's previous record for longevity turns out to have been held by the Scythia, which served for 37, some of them under wartime conditions. I can't help wondering if the original Cunard company of Great Britain would have been so quick to retire the QE2. Cunard is now part of an American-headquartered conglomerate which includes several formerly independent cruise operations. One day I had the opportunity to talk with the master of this vessel, Comm. Bernard Warner. He is never called the captain, but is often referred to in hushed and respected tones as "the commodore," since he is the most senior captain in the Cunard fleet. Perhaps because I am older than he, when I began to ask, "Tell me, commodore ..." he smiled and said, "Just call me Bernie." I also met two members of the ship's company who have been with Cunard for several years. Both express love for their ships and a life at sea. One was Amanda Reid, who joined Cunard on the Queen Elizabeth 2 as a dancer in the 1980s. Her ability and winning personality is such that she is now the assistant cruise director here. The other was Klaus Kremer, a German restaurateur who is the executive chef on the QM2. He's been with the company 19 years. Both have favorite ports when the ship is on world cruises; Amanda likes Hong Kong and Sydney. Klaus is also wild about Sydney and Auckland, and the fine restaurants he said are conveniently near the harbor. Shipboard entertainment has changed significantly over the years. The Blunt End kids, left, rehearse a skit for the passenger talent show; at right, a show is staged in one of the QM2 theaters. Like all experienced sailors, they both like to tell tales of storms at sea and how well they weathered them. Amanda recalled one decision by the captain of the QE2 to take a hurricane head-on, sailing straight into the eye of the storm. Possibly recalling the same occasion, Klaus remembers how well the QE2's kitchen responded to high winds and big waves. I added my own foul-weather experiences, telling them of my dramatic 1986 QE2 crossing, when chairs slid across the dining room with their occupants still in them. The QE2 then had two sets of stabilizers. The QM2 has four, all of which have been working well on this voyage. We were officially in "rough seas" (swells of 7 to 10 feet) for a couple of days. Yet we could hardly feel a thing. Cunard emphasizes that the QM2 is not really a cruise ship, but one designed specifically for line voyages, traveling one way from one place to another, mainly on the Atlantic Ocean between the U.S. and the U.K. Yet the ship does offer cruises, too, such as the ones around South America, plus a round-the-world jaunt at least once every other year. All of the Queens and other modern cruise ships I have enjoyed over the last half-century have been wonderful experiences, though they can't quite give me that king-of-the-world thrill I felt while riding the top of the Scythia's mast in 1957. 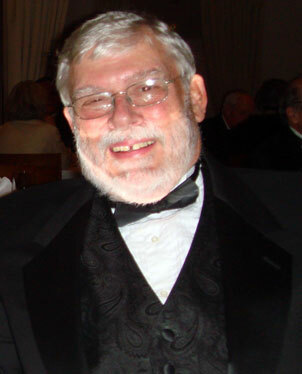 Robert W. Bone published his first freelance articles while living in Europe in 1957-58. He is the author of four travel guide books and now lives in Kailua. More photos of his trips on the Scythia and the Queen Mary 2 can be seen at robertbone.com/cunard.